These terms apply to all trips, voucher purchases and hire agreements In accepting your booking you agree to our terms and conditions. 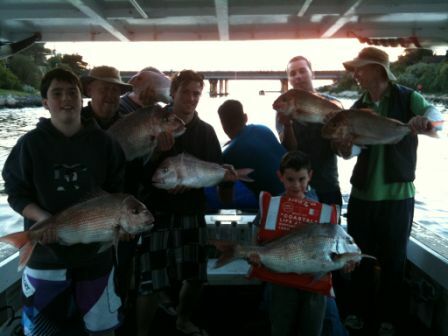 Our Melbourne fishing charters depart from ramp 1-3 launching way Carrum unless advised otherwise. All Arrive 15 minutes prior to departure. Departure times may vary from time to time due to many different circumstances that may be beyond our control this may include departing late at times. Charter times may be changed at times to depart early or late if this is the case you will be notified by email, text or phone well in advance. We don't wait for late customers (unless the boat is privately booked & the latter you are the less time you have fishing). All customers will be given a safety brief prior to departure including a life jacket drill. We have full public liability insurance. All customers are required to sign a passenger manifest prior to departure and sign a declaration that all pre-existing conditions and medication have been declared. All Customers must declare any pre-existing medical condition or any medication at the time of booking. Some customers are deemed to be at increased risk and therefore may require special attention. We have the right to ask any customer to wear a life jacket through out our fishing trip, and the right to refuse a booking or refuse boarding if you are deemed to be high risk. Pregnant women, or blind people for example are high risk. Our vessel are suitable for wheel chairs and physically handicapped people, though we must be notified before booking. Children under 14 must fish next to their accompanying adult whilst aboard our vessels. At any time any customer abuses or uses profuse language to our staff whether on the vessel or on the phone they will forfeit all money paid & will not be welcome to travel with The Reel Thing. This is a fishing charter and not a swimming charter, if you jump from our vessel or enter the water at anytime during your trip, the trip will be deemed as finished and the vessel will return to dock with no refund. All trips are subject to suitable weather conditions. Thereelthing.com.au will not cancel unless we are absolutely confident weather conditions deem it to be unsafe. thereelthing.com.au AND ITS AGENT RESERVES THE RIGHT TO CANCEL A FISHING TRIP BECAUSE OF WEATHER or other reasons beyond our control, On occasions trips will be placed on standby until 5am on the day and the client will be updated at approx 5.05am. For group charters we recommend having an alternative activity planned incase weather changes are outside our control. Occasionally the weather can change without warning and a reschedule may be necessary at short notice. The skipper, after consultation with the client dock side, has the right to cancel if deemed unsafe for the vessels crew and customers. WE don't cancel unless we are absolutely confident we have all information regarding weather. If you are cancelled you are required to make another booking via our booking page. REMEMBER - IT IS OUR AIM TO MAINTAIN A SAFE AND COMFORTABLE ENVIRONMENT FOR OUR CUSTOMERS. IT IS NOT OUR INTENTION TO SPOIL YOUR DAY. We are available everyday of the year to go fishing excluding Christmas Day, new years day & good Friday and our closed season from 1st of May through to September 30th, minimum numbers required for departure. All private bookings require a credit card 50% deposit as confirmation of booking. All small group and individual bookings are payable on booking by credit card. We require a minimum of 6 people to depart.This can be made up from individuals or a group. If thereelthing.com.au does not get the required number of people we have the right to cancel the trip. The customer will be required to make another booking via our website booking page. Discount voucher bookings are not refundable they must be rebooked as part of our terms and conditions. All details obtained from clients i.e. telephone numbers, email address, postal address, facsimile number, credit card and bank account details, are only utilized for the express purpose of the operations of thereelthing.com.au. These details are never sold, distributed or released to any other parties or bodies without prior consent. In the instance of dishonored cheques or unauthorized credit cards these details will be forwarded to legal or recovery professionals. All Payments are to be made prior to the vessel departing. The person making the booking is responsible for the payment of the entire amount. Bookings made must be paid for i.e. If a booking is for 8 persons and only 7 arrive then the full booking for 8 must be paid unless the space can be filled. We prefer mastercard, visa or bankcard. All cards incur a 3.5% surcharge. ALL DISCOUNT VOUCHERS ARE 3 MONTH EXPIRY FROM PURCHASE DATE. Please consider before cancelling a charter as to whether it is to close to the expiry date that you can not travel on another charter before its expiry as once your voucher expires it is void & can not be redeemed. If we cancel your charter due to weather or other unforeseen circumstances please rebook your charter via our booking page for the next available time before your voucher expiry, please keep in mind that sometimes you may incur a few cancellations. If you are cancelled within a month of your expiry date your voucher expiry is automatically extended by a month. If this cancellation is at the end of our season April/May you will be extended to 30th October giving you 2 months to book in the new season which starts in September each year. All discount vouchers including member discount vouchers are not valid for weekends, School Holidays or Public Holidays please check your calendar to ensure you do not book on these dates. Discount vouchers will not be honored if on sold via ebay or any other means other then our approvedon sellers. All discount vouchers must be used by the expiry date this means traveled on the vessel by the expiry not just booked in by the expiry for a date after your expiry. All cancellations & reschedules are required to be cancelled 14 days before departure to ensure sufficient time to fill the charter. none refundable & none transferable. Your expiry will be 3 months from your purchase date You must become a member to be entitled to the discount. No minimum or maximum purchase required. Bookings required and subject to availability, please book early to avoid disappointment. Departure subject to weather conditions. If your charter is cancelled due to weather in the last month before expiry you will automatically receive a month extension, if this is at the end of the season end of April/May you will be extended until 30th of October in the following season giving you 2 months to book. Minimum of 8 passengers required for departure. $24 surcharge applies on public holidays, school holidays & weekends. 1. Private Charter: We refund tariff only if the cancellation is outside 30 clear days before departure. Other wise a 50% of tariff fee is charged. If a cancellation in less than 14 days will loose 100% of tariff or tariff collected. This applies to a trip that has been rescheduled due to a cancellation. RFL are required in all Victorian waters. thereelthing.com.au has made complete disclosure of this requirement by web site, printed information, booking confirmation, pre-departure briefing. RFL are not available for purchase on board. Should Department of Primary Industries Fisheries Officers board our vessel during a trip, any passenger without a RFL is solely responsible for his/her RFL and any ramifications from such inspection. Our Staff have all been selected for their expertise in their field. As workers they are not to be insulted, sworn at, abused or defamed. The Skipper reserves the right to cancel any trip or return to any Port any individual (without refund) where staff are being harassed and or abused. thereelthing.com.au has a strict no refund policy once the trip has departed. Should an individual become unwell and request to be returned to port, the Skipper of the trip will make a decision relating to a termination of a charter or returning to port to drop a customer off. thereelthing.com.au will use their discretion as to the issuing of a refund. On the occasion where the advice of the captainand the crew of the trip is ignored by the client, there is no refund available. ALCOHOL. BYO A SENSIBLE AMOUNT ON THESE CHARTERS, NO EXCESSIVE CONSUMPTION OF ALCOHOL. MSV. THE REEL THING IS NOT LICENSED FOR ALCOHOL SO THE FOLLOWING BYO RULES APPLY YOU WILL BE NOTIFIED IF YOU ARE ON THIS VESSEL. You are welcome to bring along a responsible amount of alcohol but please remember on a shared charter to have consideration for other passengers a couple of cans per person may be consumed. We are a little more lenient with Private Charters as they have the boat to themselves, but all policies must be adhered to. It is permissive for a small amount of alcohol ( beer or premixed ,still wine) to be brought aboard for personal consumption - a small amount is considered no more than 3-4 cans per person. It is always requested that any alcohol brought onto the boat be in cans. STRICKTLY NO GLASS OR HARD SPIRITS. The skipper has the right to refuse to allow alcohol to be brought on to the vessel. If a group arrives for their charter clearly under the influence of alcohol and the skipper is of the opinion that the group is not in a suitable condition to partake in the charter, the trip will be cancelled and the full amount of charter will be forfeited. The skipper reserves the right to refuse boarding to any person he or she believes is intoxicated prior to the commencement of the trip. During a trip, should the consumption of alcohol result in unruly behavior, the skipper reserves the right to terminate the trip without refund, The Skipper reserves the right to notify Police of the imminent return to the closest Port of Drunk & Disorderly customers. Any equipment lost due to negligence will be charged up to $300 per rod and reel unit and or cost's incurred in damage repair to boat. It is a requirement that all Customers behave in a respectful manner whether that be prior to, during or after the charter, having full consideration for all other users of the Pier and it's immediate vicinity. Obscenities and unruly behavior will not be tolerated under any circumstances and may result in your booking being cancelled and payment forfeited. Drugs are not tolerated in any form. If a customer attempts to smoke or consume an illegal substance the skipper will immediately report this to the Marine Police and the trip will be immediately cancelled. No refund will be paid and the matter will be handed to the police. All customers will be given a full safety and security brief prior to the vessel leaving port as part of our duty of care. Customer's will be asked about pre-existing medical conditions and declaration about any medication. These details are entered into the ships log. Customers are asked to complete a liability release and assumption of risk form prior to departure if a pre-existing condition is present. A non declaration of a pre-existing medical condition is considered negligent and thereelthing.com.au takes no responsibility for an incident arising. Please remember we are at the hands of nature with some days producing more then enough fish for all on board & others very quiet, we guarantee to use all our skills & devices to turn the odds in our favor but sometimes this is not enough, Your day is to be enjoyable so please enjoy your trip & if it all goes our way you will be going home with a feed, if not you have had a most pleasurable day out on the water. We promise to do our best to make your day run as smoothly as possible from your initial reservation through to your day on the water. Our team promise to do their very best to make your day safe and comfortable given the varying conditions at sea. Customers are reminded that our vessels are fishing vessels not 5 star luxury liners. Our Toilet facilities are clean. The toilets are marine style and good for liquid waste only (no. 1's). We recommend using a toilet before departure at public facilities at Launchingway for no.2's. Vessels are confined space. Smoking is allowed in designated area as directed by the crew. 7 - 12 years and under, is considered a child. We request that each child is supervised by a full fare paying adult, on a 1: 1 ratio, other wise a full fare is applied to the additional children as we have limited positions on board. 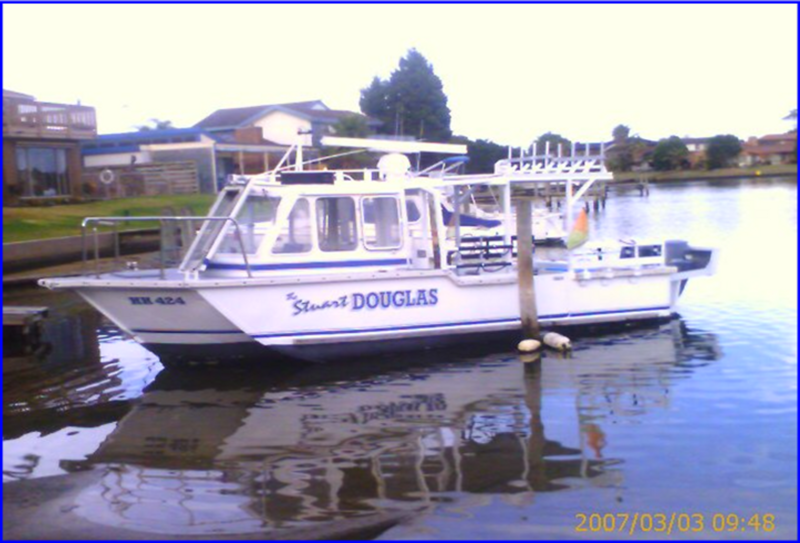 As a consideration to other fisherman, large family groups may be asked to hire a boat privately. Max 4 children per charter on mixed charter at the discretion of thereelthing.com.au reservation staff. Children under 15 must be accompanied by full paying adult this does not mean children are free this is in relation to vessel number requirements. thereelthing.com.au has the right of refusal to any booking deemed to be at increased risk of safety with out prejudice. This includes any customer with a pre-existing condition or any medication that puts the charter and customers at additional risk. 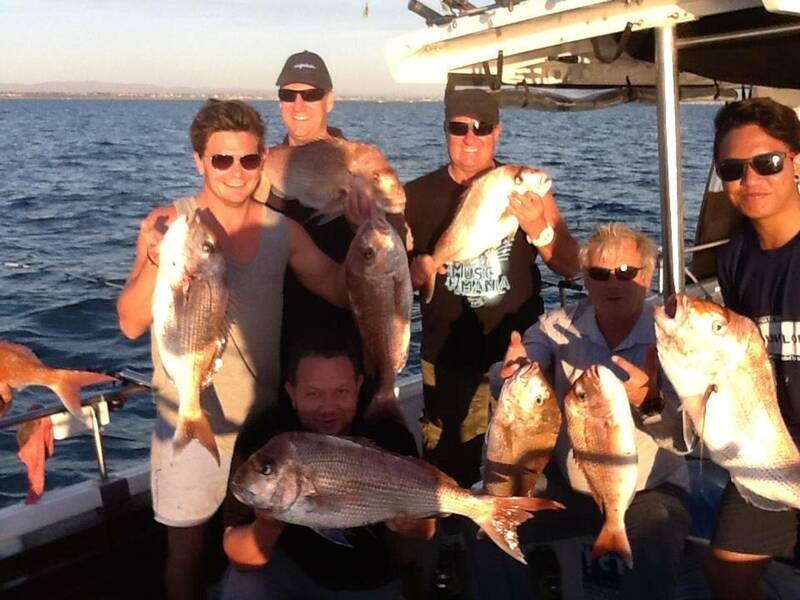 Our team love fishing and we want to show our customers a good time. We do not tolerate negative or poor behavior. Come prepared to only have fun!